Mr. Peter Paul Rickham, formerly chief of the Department of Pediatric Surgery, Kantonspital University of Zurich from 1971 - 1983 died on the 19th of November 2003 after a long illness. He was 86. He was married twice and has 3 children and 4 grandchildren. Mr. Rickham was born in Berlin on June 21, 1917, qualified from St. Bartholomew's, London, and Queen's College, Cambridge, and served in RAMC. After World War II he was appointed to Liverpool, United Kingdom, as a SR and subsequently a consultant in 1953 with Isabella Forshall, who had established the Paediatric Surgical Service there. Sir D. Innes Williams described Mr. Rickham as having “a dynamic personality and a driving ambition”. The combination of the contrasting personalities put the Liverpool paediatric surgical service on the international map and Peter Rickham's indefatigable travelling spread its influence widely. Forshall with Herbert Johnson and Peter Rickham formed a formidable team at that time. His drive and desire to see things done and done quickly did not always endear him to the administrators and he decided in 1971 to move to Zürich where he became chief of the Paediatric Surgical Department of the Kantonsspital of the University until his retiral in 1983. 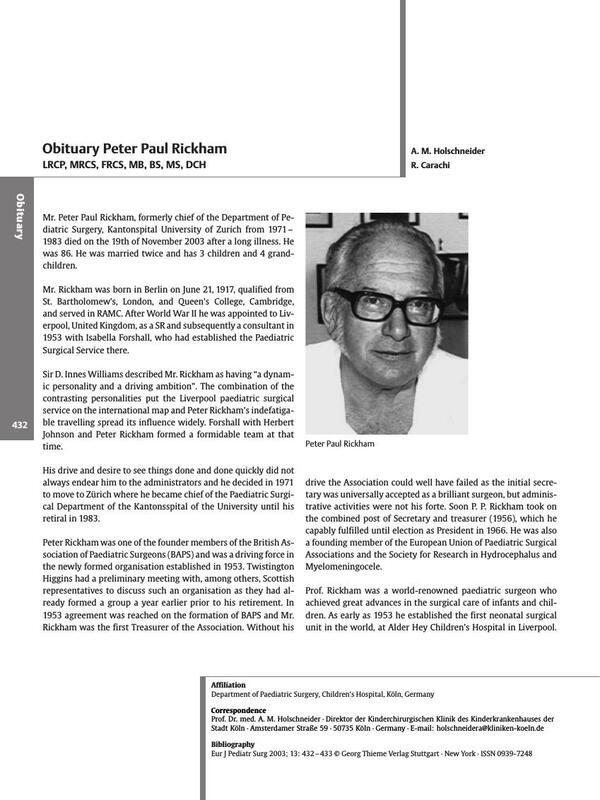 Peter Rickham was one of the founder members of the British Association of Paediatric Surgeons (BAPS) and was a driving force in the newly formed organisation established in 1953. Twistington Higgins had a preliminary meeting with, among others, Scottish representatives to discuss such an organisation as they had already formed a group a year earlier prior to his retirement. In 1953 agreement was reached on the formation of BAPS and Mr. Rickham was the first Treasurer of the Association. Without his drive the Association could well have failed as the initial secretary was universally accepted as a brilliant surgeon, but administrative activities were not his forte. Soon P. P. Rickham took on the combined post of Secretary and treasurer (1956), which he capably fulfilled until election as President in 1966. He was also a founding member of the European Union of Paediatric Surgical Associations and the Society for Research in Hydrocephalus and Myelomeningocele. Prof. Rickham was a world-renowned paediatric surgeon who achieved great advances in the surgical care of infants and children. As early as 1953 he established the first neonatal surgical unit in the world, at Alder Hey Children's Hospital in Liverpool. Within 4 years the overall mortality for surgical neonates weighing less than 2500 grams dropped from nearly 100 to 42 %. In 1969 he wrote together with J. H. Johnston the well-known book on Neonatal Surgery and in 1983 the first textbook for students in German language together with R. T. Soper and U. G. Stauffer was published. Already in Liverpool Prof. Rickham and his colleagues had established a training program based on the training modalities of Dr. Robert Gross in Boston. Prof. Rickham published more than 200 papers in scientific journals writing in English, German and French. He has received many awards and honours including the Denis Browne Medal of the British Association of Paediatric Surgeons and 2001 the Ladd Medal, the highest honour bestowed by the Section of Surgery of the American Academy of Pediatrics, as well as many others such as Honorary Doctor of Medicine, University of Göttingen, Germany 1967, Gold Medal of the Children's Hospital of Philadelphia 1968, Chévalier of the Légion d'Honneur, France 1979, Knight Commander of the Grand Cross of the Order of Merit, Germany 1988, and became Honorary Member of 18 International Associations of Paediatric Surgery all over the world. The Alder Hey Childrens Hospital honoured him by introducing a biannual Peter Paul Rickham Symposium with a special PP Rickham Lecture which this year was held by Dr. J. Mulliken, Boston, on Vascular Anomalies. The British Association of Paediatric Surgeons established the prestigious Peter Paul Rickham prize. For many years Mr. Rickham took an active and energetic part in the Editorial Board of the former “Zeitschrift für Kinderchirurgie”, today “European Journal of Pediatric Surgery”. He was a founding member of this journal in 1964 together with Fritz Rehbein, Bremen, and M. Grob, Zürich. Besides, he founded in 1970 together with W. Ch. Hecker and J. Prévot the periodical “Progress in Pediatric Surgery”. A stroke in May 2001 severely disabled Prof. Rickham but this did not stop him travelling. He died on November 19, 2003. The pediatric surgical community all over the world has lost one of the most important paediatric surgeons of the last century. All those who knew him closely will always be conscious of his great help and friendship.